Helena Park Hotel(ex. RIU) in Sunny Beach Resort on the Black sea in Bulgaria. 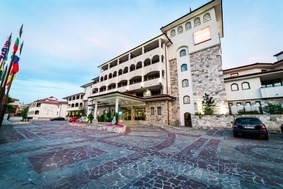 Luxury hotels in Sunny beach, Bulgaria. - 10 % discount until 30 April 2018. - 7=6, 14=12, 21=18 for arrivals during the period: 01 May - 31 May 2018; 18 Sept - 15 Oct 2018. Hotel Helena Park offers 232 guestrooms. Location: Situated directly on the beach, In a 14,500 m2 garden together with the Helena Park Hotel. Room Facilities: air-conditioning, direct dial telephone, satellite/cable TV, safe deposit box, minibar, bath/WC, hair-drier, balcony. Most rooms have sea views. Sports & Recreation: tennis court, park, fitness center, indoor swimming pool, outdoor swimming pool, steam bath, solarium, sauna, massage, jacuzzi, hydro-jet, medical and spa center. * Buffet with main courses and dishes prepared on the spot. Vegetarian options available.